Advocate and Streetsblog tipster Dale Munroe put this back on our radar: the $20 million Second Street Project, after nearly seven years of outreach, design, development and construction, is already failing cyclists in a big way. As part of the project, the city has installed raised bike lanes between Market and Howard–with a few gaps. However, there’s no protection and the little curb between the street and the bike lane is easily mountable by motorists. As a result, it has become yet another de facto delivery-and-drop-off lane; it’s continually blocked by scofflaw motorists. The part that’s really frustrating is that SFMTA promised improvements 6 months ago but nothing has been done, leaving cyclists that once had a bike lane to ride in the street. On October 1, 2018, Jamie Parks from SFMTA said “Green paint, lane markings, parking stall markings, signs and posts will be installed Dec – Jan from Market to Folsom once paving is done. (Enforcement will start then also)” (https://twitter.com/transpocrat/status/1046822397242793987?s=19) but it’s now 6 months later and nothing has changed. Still not convinced the 2nd Street lane is rendered useless to cyclists? You can also “…check out the map of blocked bike lane reports at safelanes.org — there have been 42 blocked bike lane reports in the last seven days for the two blocks between Market and Howard! Yet somehow SFMTA has left this project unfinished for months, ignoring the safety concerns of people who bike here daily,” wrote Munroe in his email. None of this should really come as a surprise considering the history of bike-lane violations on Valencia, Masonic, Market, or anywhere else with heavy traffic–an unprotected bike lane, raised or not, is pretty much a waste of paint and/or asphalt and concrete. Unless we start impounding cars and revoking the licenses of offenders, the only way to keep cars off a bike lane is with a physical barrier. And yet, some politicos want to install more unprotected bike lanes, even as more and more cyclists die trying to navigate them. In the meantime, Streetsblog hopes the city can do more than add safe hit posts to 2nd (when and if it ever really gets around to doing it). How about true barriers, such as those shown in the above photo in Oakland? Or something more attractive–as long as it physically stops cars from incurring into the bike space. Streetsblog has an email out to the SFMTA, Public Works, and Supervisor Matt Haney’s office, and will update this post accordingly. For the record, the truck in the lead photo eventually got ticketed. A reminder for people who cycle or walk in SoMa, tonight SFMTA is holding an open house on the Fifth Street safety project at the Bayanihan Community Center, 1010 Mission Street, Wed. April 3, 5-7 p.m. The San Francisco Bicycle Coalition is urging people to turn out and demand protected bike lanes–and/or email your views via the SFBC’s form. It’s inexplicable. We spend months and all this money on this project, and this is the very obvious result. Every time I’ve tried to ride a bike down 2nd, the lane is blocked by cars, and the raised design just makes it worse, making it harder to safely pass. No design is ever going to be perfect, but I don’t see any effort on the part of SFMTA to notice that this is happening and react. There are good people at that agency who care about this stuff, people who put a lot of time and effort into building out 2nd St. Where are they now that the job has been left unfinished? Realistically speaking, what can SFMTA do? They would need people writing tickets 24/7 and I doubt that’s gonna happen. I’m going to give them benefit of doubt since the full project is still under construction. Curious that if red-light cameras pictures need to be confirmed by a police officer of a violation, why can’t the above twitter feed of the violations serve the same purpose? Wouldn’t that pay for itself many times over? How about we wait until the project is complete before calling it a “fail”? C’mon Streetsblog/Roger. An inability to enforce a law due to the level of law breaking is a pretty bad stance to take. I know you base your comment on the desired results of unblocking the lane, but still…. Somehow, cities like Amsterdam manage to have miles and miles of bike lanes that aren’t constantly blocked by cars, so this is not an entirely unsolvable problem. There’s enforcement, there’s physical barriers to keep cars out, there’s leading a cultural change among drivers. I’ve even seen a food truck parked in the 2nd St bike lane; surely we can come up with some kind of mechanism to not have entire businesses blocking a bike lane for hours. If it’s about resources, we apparently just spent $20M on this project. How much more would it cost to appoint a corridor manager who is responsible not for the physical construction, but the success of the project overall, a person who ensures that there’s actually “a pleasant multi-modal corridor that improves safety and access for pedestrians, bicyclists and transit as well as drivers?” Because what’s unrealistic is to spend 20 million dollars on a street, see all that money be wasted, and to not do anything. I’m surprised by the commenters here saying to wait for the project to be complete. First, the official project web page says that Segment 1—Market to Folsom was completed in February, so it certainly seems like it’s time to start evaluating the results. The raised green lanes have been in place for months. How long are we supposed to keep having an unsafe street before we agree that it’s time to ask questions about it? The city should not be leaving streets in unsafe conditions for months on end, and if there’s a reason the project isn’t actually finished, that should be communicated, with a clear plan for how it’s actually going to be better when the job is done. How about the city provide us with safe paths while the construction is going on? Going by the posted plans, what’s left to do in the segment pictured in the lead image? That segment appears to be finished. @p_chazz – The whole point of “protected” infrastructure is to obviate enforcement. Implementing it like this, as free parking for whomever fits wherever they fit, only encourages bad behavior. @crazyvag – It’s hard to give them the benefit of the doubt when so many of the people parking are the ones doing the construction. Their trucks have already degraded the surface of the bike lanes (surface not designed to hold trucks) before the project is even completed. What should they do? How about they make the “protected bike lane” actually protected with a physical barrier. Make protective refuge islands with bike chutes so that bikes don’t conflict with turning vehicles. The unprotected bike lane isn’t much of an improvement because it’s obstructed more then it’s not. It’s become a parking lane. This is what we’ve been saying all along and what they’ve known in biking capitals all over the world: All urban unprotected bike lanes become parking lanes. Anywhere anyone can park a car, they will. This bike lane was poorly designed, completely defeating its purpose for building it. If this econo-bike lane really cost $20 million dollars, then there’s no hope for this city! I really hope 99% of that was for unrelated subsurface utility work. > if red-light cameras pictures need to be confirmed by a police officer of a violation, why can’t the above twitter feed of the violations serve the same purpose? I would imagine that the most important difference is that the red light cameras are a trusted source (modulo conspiracy theories), while random pictures from unknown people aren’t. A red light camera isn’t going to, say, photoshop the license plate number of someone they don’t like onto a picture of a traffic violation and then submit it via 311. Or take a few photos of the same violation from different angles, change the timestamps in the metadata, and then submit one photo each over the course of a few months to cause someone to get multiple tickets instead of just one. There’s a big difference between a police officer verifying that a photo that can assumed to be accurate is showing a violation, and verifying that an untrusted photo is real. So we’re stuck with hoping that the city will use the submissions that back that Twitter feed to prioritize protected infrastructure in high-report areas, as is the theoretical intent. The problem there is that it only pays for itself if it’s not working very well. If a surge in enforcement is effective in actually eliminating, or mostly eliminating, violations, and you were relying on tickets to fund the enforcement, you’re left with a hole in the budget. So you have to reduce enforcement staffing, and then people go back to not being afraid of getting a ticket, and the cycle repeats. For enforcement to be a real long-term solution, we would need to be willing to pay for it, rather than expecting it to pay for itself. That’s the advantage of automated enforcement (which should cost much less to sustain over time), or even better, engineering solutions that prevent the need for enforcement at all. Just witnessed a parking officer glide right by 2 lyfts parked directly in the “finished” bike lane; zero enforcement – its a total failure. Remember when downtown was supposed to be car free by 2020? That was before Uber and Lyft and a gaggle of newly wealthy 20 and 30 somethings who enjoy being driven around. Replacing 2 story buildings with 30 story buildings is only adding to the density. The city is only going to put so much effort in because it’s the automobiles paying the registration fees, parking meters and tickets, and gasoline taxes that pay for the roads. Bicycles contribute nothing financially. Gasoline taxes do NOT pay for the roads. We can’t possibly do it here, but other places have figured it out. 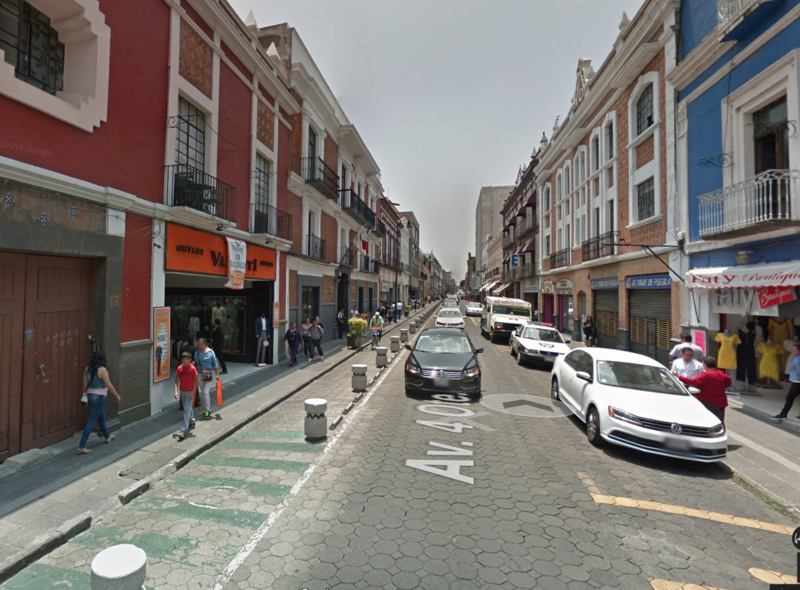 An example of the impossible in Puebla, Mexico. Rode 2nd again today during lunchtime. 3-4 trucks in the bike lane (I’ll give a pass to the construction crew working on the sidewalk), but my bigger problem is the guy who ignored the “no right turn” sign and tried to right hook me by turning across the bike lane. In San Francisco, it’s self-evidently a terrible idea to trust people’s lives to the proposition that 100% of drivers will obey no right turn signs, and this design is a serious injury or death waiting to happen. Of course, then I got to 6th and Howard, and right in the spot where Tess Rothstein was killed last month, a rideshare driver was stopped in the newly-created no stopping zone. Parking officers are part of the problem. I’ve seen them drive their motorized trikes down the bike lane on Embarcadero and then stop (blocking the bike lane) to write a ticket for a car which was parked illegally (but not unsafely). It’s a good point, but that’s why we have app stores that only allow trusted app and apps can be deployed with certificates making them the only ones allowed to connect to cloud services that would receive those photos. “trust” is a solved problem on mobile platforms. Heck, when was the last time you heard of anyone hacking their phones Netflix app to steal video? Plus, it doesn’t have to be the police. Uber and Lyft could both be required to allow violations to be submitted. This project apparently costs 20 million dollars (presumably on paving and utility work? I have no idea). For 10% of that, we could fund two shifts a day of rather well-paid parking wardens to do nothing but patrol back and forth over a couple blocks of 2nd St every day for a decade. I think the right turn treatments on 2nd are so bad I was going to save it for another post. The Dutch have figured out how to do this too–you need to place some concrete forward of the crosswalk and the bike lane has to jog right. That forces motorists to take a really slow right (or they end up ON the concrete) and it takes cyclists out of their blind spot. SFMTA already knows this from their one protected intersection. I look forward to your future post. Any design that relies on drivers to obey regulatory signage to avoid death to pedestrians and cyclists is not safe. That should have been the lesson from the repeated injuries and deaths at Market and Octavia. I’ve also had close calls with drivers at the similar “no right turn” intersections on Folsom, and a terrifying one at the Market and Valencia turn pocket when a driver blew the mid-block red light. We can’t make dangerous intersections safe with signage; they need to actually be safe by design. I was in the Netherlands recently, and yep, protected intersections work. You can combine Howard and 2nd into one big death-trap like I do daily. Get off BART at Embarcadero and grab a GoBike on Beale. You’re on the wrong side of the road so cross Beale, ride past all the Uber drop-offs between Mission and Howard. Ride down Howard in the lane because it’s bumper-to-bumper delivery trucks in the bike lane. You’re on the wrong side of Howard so cross over to the left side between 1st and 2nd, where Howard is six lanes and 80 feet between building faces so everyone is going 50 MPH. Turn left on 2nd but don’t kill yourself by hitting the new bus stop in the middle of the road; instead somehow make a 90-degree turn into a bike lane that’s 18 inches wide. Then dismount and get up on the sidewalk because there’s some guy parked in the bike lane and between him, the curb, and the bus stop you’re boxed in. It’s all awful. But isn’t that the horrible tickets that we’re constantly told the greedy city uses to line its coffers and pay for roads? Sounds like a win-win-win! @Dirk – Bicycles contribute nothing financially, aside from some sales tax, but bicyclists contribute plenty. Also, our bicycles don’t inflict as much cost as automobiles — nor do registration fees, parking meters and tickets, and gasoline taxes cover that cost — so on balance we actually contribute more. At least we can do that now, rather than trying to wait on hold for a live person while trying to bike somewhere. I’ve had reasonable success getting scofflaws ticketed via the 311 app. That’s a Twitter feed of bike lane violations reported via the 311 app. The reports are public. The app specifically says that bike lane violations are “information only”. They don’t send people to issue tickets based on blocked bike lane reports, they just gather the data. Has Oakland Turned a Corner on Protecting Cyclists During Construction?